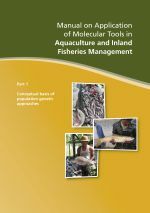 Asia has been the cradle of integrated crop-livestock-fish (mainly carp) farming systems, which evolved by themselves since the inception of human civilisation particularly when the human settlements started moving more towards inland leaving the river banks. And to meet their water requirements they started constructing rain or flood fed water retention/detention structures which formed the nucleus of such intergration. Based on empirical knowledge of the farmers, the systems have a history of over two millennia in parts of south and southeast Asia. However, the importance of the systems has been realised of late and scientific basis of which are being investigated to evolve proper technologies to get optimum productivity of the land, labour, waste and water. The systems help poor fishermen and small farmers having too small holding for crop production and a few heads of livestock to diversify their farm production, increase cash income, improve quality and quantity of food produced and exploitation of unutilised resources. 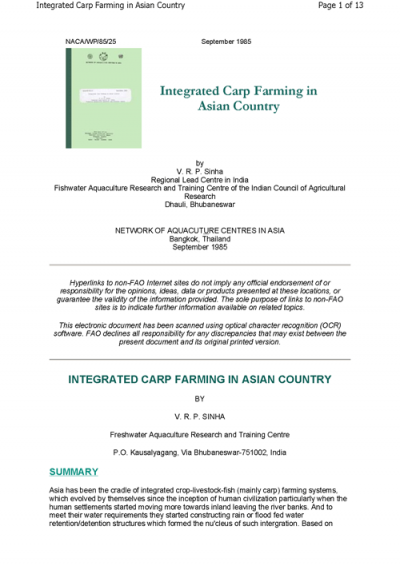 The paper enumerates different carp integrated farming systems being prevalent in Asia along with certain successful case studies indicating potentiality and constraints of such systems. On the basis of which it is recommended that utmost emphasis is needed to integrate carp farming with agriculture and irrigation, livestock farming, sewage utilisation and water pollution control not only to increase the productivity of land and water and improve the economic conditions of poor farmers but also to maintain health and hygiene of the rural poor and city dwellers alike.